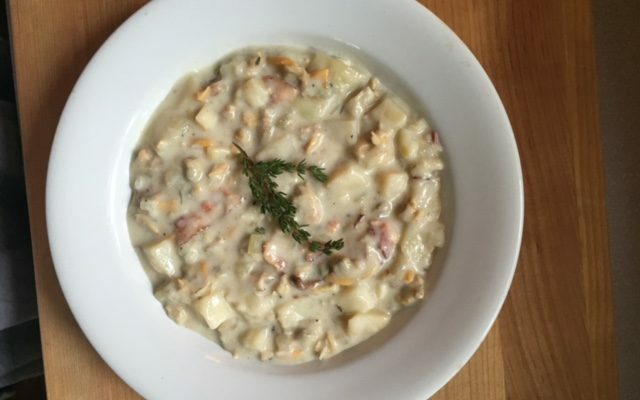 The time of year is here where we are more apt to serve soups and enjoy the hearty flavors of something substantial such as the BEST ever New England clam chowder. What makes this soup so yummy is that there are a lot of fresh sweet clams and it is thick but not overly like you often find in restaurants. I thicken this chowder with a mixture of cream and flour that you whisk into a paste and then dollop it in as you need it. If you cannot find baby littleneck clams you can use canned ones, simply save the juices they are packed in and add them to the soup. For fish stock you can substitute bottled clam juice (found in any grocery store). This is the best chowder for guests, super impressive. 1. In a medium skillet cook the bacon until crisp- about 6 minutes, set aside on a paper towel to drain. 2. Heat a medium wide saucepan over med-hi heat. Sauté the onion, celery, garlic, bay leaves and thyme in the oil until onions are golden, about 7 minutes. Add the fish stock and deglaze the pan. Add the potatoes, salt and pepper and reduce heat to med-low and simmer until potatoes are tender about 15 minutes. Add the milk and bring to a simmer. 3. Bring the wine to a boil in a medium saucepan. Add the clams, sprigs of thyme, butter, salt and pepper to taste and cover. Allow clams to open removing them as they open, about 5 to 8 minutes. Set aside reserving the cooking liquid. When they are cool enough to handle, remove the clams from the shells. Discard the shells and add the cooking liquid through a strainer to the soup. 4. Meanwhile, whisk the flour and cream together in a small bowl. Add to the soup and stir until thickened. Taste and adjust seasoning. 5. Add the clams to the soup and turn off the heat. Serve chowder in large bowls with the parsley as a garnish.